This is the first in a series launched under the William W. Johnstone with J.A. Johnstone brand. 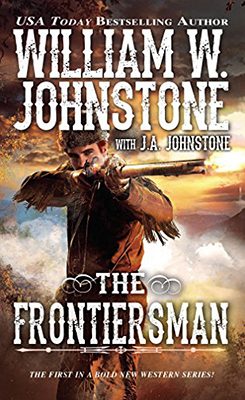 Currently there are four in The Frontiersman series, with a fifth announced for release in 2019. Like in any opening book to a series we are introduced to Breckinridge and his family and the relationships between them. We also witness Breckinridge’s impressive strengths and ability to fight as the opening scenes describe a bloody battle between him and some Chickasaw braves. Breckinridge’s belief that he’ll marry Maureen Grantham is important to the plot too, and it’s the latter that leads to events that see Breckinridge go on the run. The plot thread of Breckinridge being wanted links each new adventure he finds himself having as he teams up with various parties in his bid to reach the Rocky Mountains. It’s these encounters that will see Breckinridge’s resolve tested time and again in a series of deadly and violent situations. The author tells this very fast-moving tale in gripping prose that kept me turning the pages. Characters are well-crafted and each has an important part to play in the storyline and the writer is not afraid to kill them off to add to the suffering Breckinridge must endure. Action scenes – and there’s plenty of them – are extremely well-written, brutally desperate struggles for life that are very visual. As the story races to its end, it becomes obvious not all the plot threads are going to be tied-up thus ensuring the reader will pick up the next book in the series and that is something I will certainly be doing very soon. A book that should appeal to all western readers, especially those who enjoy mountain men tales. I'll have to read one of the Johnstone books soon, and this sounds like a page turner. I wish that, like the Ralph Compton westerns they would acknowledge the true author. That keeps me from buying the Johnstone books.